Growing the sweet potatoes at home isn’t hard, but it requires your attention during the process. To learn more about how to do this, read more below about the basic things of growing them in your garden. Before planting the sweet potatoes, you should inform yourself about the 16 varieties and decide which one works the best for you. The most popular type of sweet potato is the jewel that has orange flesh and copper skin. However, other varieties are worth trying as well. Another widely-used variety is the Beauregard, a red-skin cultivar ideal for baking, frying, mashing, and boiling. Don’t worry about the location too much! They thrive in a sunny vegetable garden, but you can also plant them in other places such as in a container or on a trellis. If you decide to plant the sweet potatoes in a patio planter, it will reward you with foliage in the fall and you can also harvest roots from it as well. However, just make sure you plant it in full-sun location 3 to 4 weeks after the last frost ! Unlike many other plants, the sweet potatoes like to be planted in a warm soil. They require a not-so-rich soil that has pH somewhere between 5.8 and 6.2, but they can tolerate a slightly acidic soil down to 5.0. They love sandy, loose soil, but whatever you choose make sure it’s well-drained. 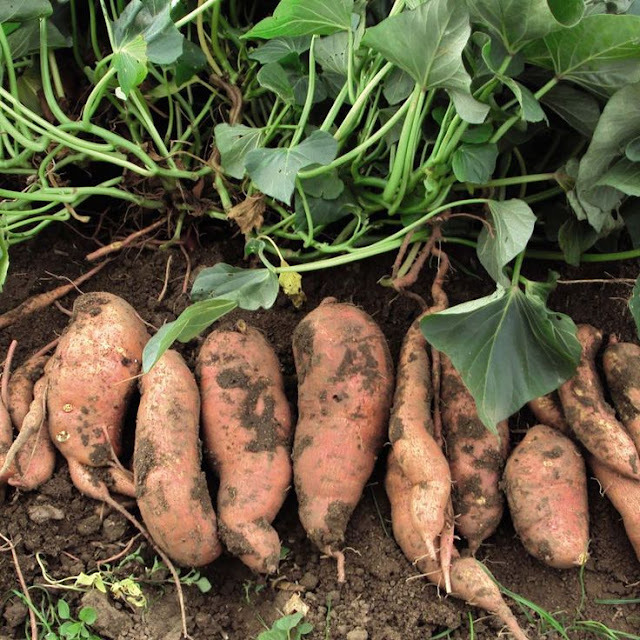 Unlike most of the vegetables that grow from seeds, sweet potatoes are started from slips. One sweet potato can produce up to 50 slips. You can either buy them or create them your own. If you go for the second option, you need to wash well the potatoes and cut them in half or in large sections. After you do this, place the cut pieces in a jar or glass of water, half below and half up. Use toothpicks to hold the sweet potato in place. The slips should be planted in a hole that’s 4″ or 5″ deep and 3″ wide. The roots of the slips should be pointing down, and half of the slip should be covered in dirt, while the other one above the ground with its new leaves. Cover the hole with dirt, but carefully without bruising the potatoes and then press them gently. It is recommended to use black plastic for mulch because it keeps the soil warm – and this is what the sweet potatoes really like! Besides this, the black plastic keeps the vines from setting more roots as they grow. You can also use organic mulch such as straw or paper and it can also help in suppressing weeds and it maintaining the soil’s moisture. Once you plant the sweet potatoes, you need to water the slips every day for the first week, and then every other the second one. Make sure all the dirt is wet, but once you notice the mounds to erode, you need to stop watering them. 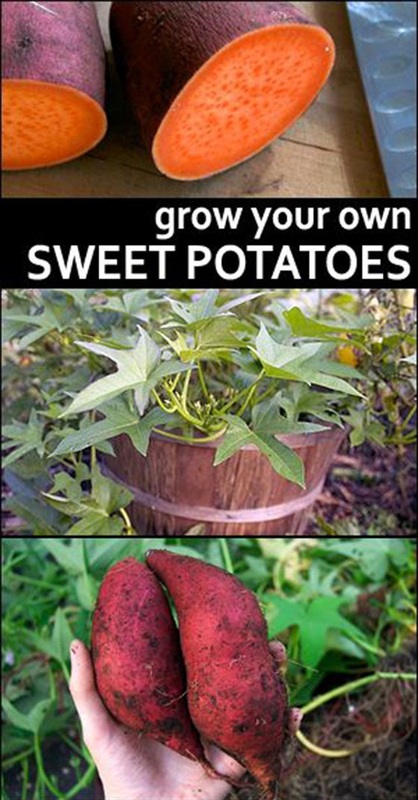 The sweet potatoes are a little bit of drought-tolerant, however, they will produce less. That’s why it’s important to schedule the watering along with the circumstances. You need to apply fertilizer during 2-3 cultivations and it can be either banded or broadcast after transplanting. It is recommended to use moderate amounts of nitrogen and phosphorus, but more amount of potassium – in case of not enough potassium, the sweet potato can grow malformed. Usually, you can dig up the sweet potatoes 3-4 months after you planted the slips. By this time, they should look big enough for culinary purposes. When pulling the potatoes out of the ground, you can use spade fork for digging, but you should be very careful to not bruise them. Pull the primary crown up and with your hands dig up the sweet potato. Shake off the dirt and don’t wash the roots. Curing is a process that has to be done so that the sweet potatoes can have their sweet taste. They have to be cured for 10-14 days during which the roots are kept in a warm place with a temperature of about 80°F at high humidity (this should be about 90%). Curing will heal the skin damage of the harvesting by forming a second skin over the scratches. After the curing, store the sweet potatoes in a place with a temperature of at least 55°F.